தொண்டாம் எனத் தெளிந்த தூமனத்தார்க்கு – உண்டோ? thoNdAm enath theLindha thUmanaththArkku – uNdO? uRavu uNdO? – ever have a relationship/contact? paNdE – The word “paNdE” should be added with “uyir” and “thoNdAm” to get “paNdE uyir thoNdAm”. 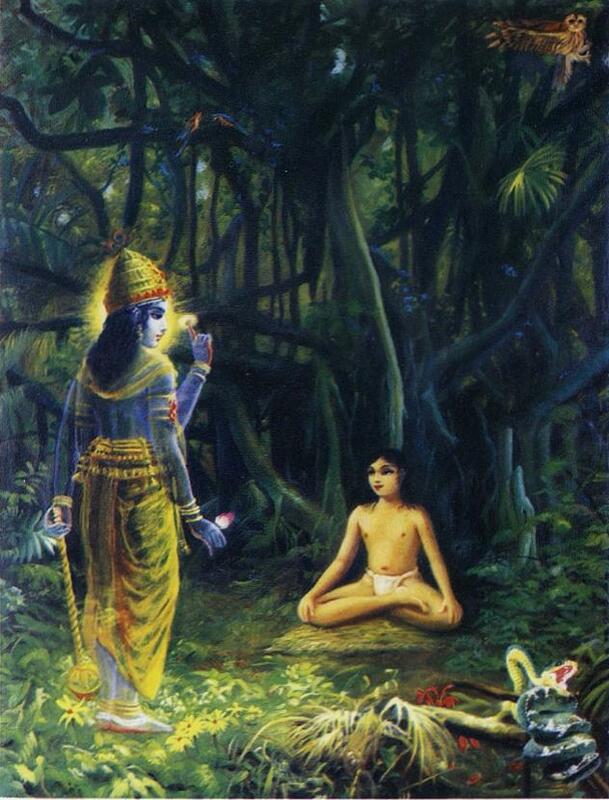 This would mean that the soul’s inherent nature is to be a servant to its master, i.e., sriman nArAyaNan. More importantly, this inherent nature of the soul is not something that sprung just now. It has been there forever. There is no start time to that and no end time for this unbreakable nature of soul and its master. uyir anaiththum – The word “uyir anaithuthum” means everyone. Since it is being said as “everyone”, each and every soul is a servant to its one and only master sriman nArAyaNan. Hence, it disproves the fact that only some souls are subservient to its Master and the rest of the souls are not. pangkayath thAL nAyagaRkE – The aforementioned phrases talks about being servant to someone. However, that someone is being explicitly stated in this phrase of the pAsuram, namely “the ONE who is the hero of the one who sits on the lotus flower”. Since it is being mentioned as” pangkayath thAl nAyagaRkE”, it is implied that all the souls are not subservient to just perumAL alone. They are all servants to both perumAL and HIS wife (pirAtti) alike. The case ending in “nAyagaRkE“ is “E” that denotes “only to perumAL andpirAtti, and to no one else. This is 4th level case ending in thamizh grammar and this clears up any question that might arise like “are the souls servants to these two namely perumAL and pirAtti in addition to someone else”? The answer is “no” as explained by the fourth level case ending “E” in nAyagaRkE”. thoNdAm enath theLindha thUmanaththArkku: In this phrase, swami aruLALa mAmuni talks about certain group of people whom he calls as “thUmanaththAr”. They are those people who know the meaning of thirumanthiram completely and thereby understand and appreciate the fact that “a soul is subservient to its eternal master sriman nArAyaNan and no one else”. This thought which is a condensed thought of all Vedas is what is contained in thirumanthiram. uNdO? – There is not. Swami asks a question “is there” (uNdO?). The context to this question is mentioned in the latter part of the pAsuram in the word “uravu” (relationship). So, the words “uravu” and “uNdO” needs to be joined to ask the question that is being put forth is “is there a relationship”? The answer is no. pala kaRRum tham udambaip pArththu abimAnikkum – “pala kaRRal” is learning a lot about different things sAsthrams that includes the likes of vEdAs, manu smirthi, tharkam, vyAkaraNam etc. “tham udambu” refers to “one’s body”. It is the place where the condition such as “brahmachari” (bachelorhood) for varNam like brAhmaNan resides. The reason swamy aruLALa mAmuni used “tham udambu” is to point out the fact that people look at their bodies and take great pride in them when they say “I am from such and such caste, such and such creed”. They think so high of themselves thinking about the condition in which their body is currently in like “brAhmachari” etc. ulagaththavarOdu uRavu – This refers to the bunch of mundane people who regard themselves as “high” based on just the caste / creed in which they were born. thUmanaththArkku – We need to join the phrase “thUmanaththArku”, “uNdo” and “uravu” to mean “For those people who are regarded as “thUmanaththAr”, will there be any relationship to these other group of people who regard themselves as “high” based on their birth / religion. Swami aruLALa mAmuni answers this question by saying that there will never be any relationship. Inner Meaning: “Aum” that is also called as “pranavam” revealed the fact that all souls are subservient to the ONE who is being referred by “A” (sriman nArAyaNan). The souls are being referred by “Ma” component of “m”. These souls that are being appalled by “m” can be defined as that which has conscience and thus is different from non-living objects that do not have any conscience. These souls are knowledge and happiness personified and is always a servant to its master sriman nArAyaNan. Those who know this definition of “m” are considered to be “thUmanaththAr”. To these “thUmanaththAr”, will there be any relationship ever with those who does not know the definition of “m”. Never. Those who do not realize this true definition of “m” will always regard their body as everything and will not differentiate between it and the soul. They would take utmost pride in being born in a high caste. So, there can never be any kind of relationship between these two sets of people ever. One may get a question here as to what would the “thUmanaththAr” tell the other kind of people when they happen to meet each other. In order to illustrate this, there is a story. “Thiruvahindirapuram” is a place near Cuddalore, South India. There lived a person by name “Villiputhoor pagavar” in that place. He was a famous sanyasi who had renounced everything with the thought that they will never be the means but only perumAL’s lotus feet is the only means and end. He used to go to river to take bath and while doing so, he would never go to near the same shore as brAhmanas go and take their bath. This happened for quite some time. One day, these brAhmanas gathered together and asked “villiputhOr pagavar”, “Hey! Why are you not taking bath in the same shore as us? Why do you keep yourself aloof and stay away from us all the time”. villiputhOr pagavar replied, “Hey brAhmanas!!! We are servants of Vishnu but you are those brAhmanas who follow dharma based on your caste. There is no relationship whatsoever between us. We are servants of sriman nArAyaNan. There is no way for us to have any kind of contacts/relationship/friendship. 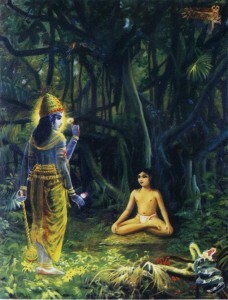 Swami manavALa mAmunigaL, who writes commentary for this gyAna sAram talks about this story in this pAsuram’s explanation.